Got you going, didn't I? And a fine cool day to be in Florida, too! The town of Florida hosts the highest elevation along the Mohawk Trail cresting at 2173 feet at this location. The route follows an old Indian trail over the mountains. There are some great views from the Mohawk Trail. A hairpin curve coming down into the town of North Adams. The RV did fine when we came through there again today. 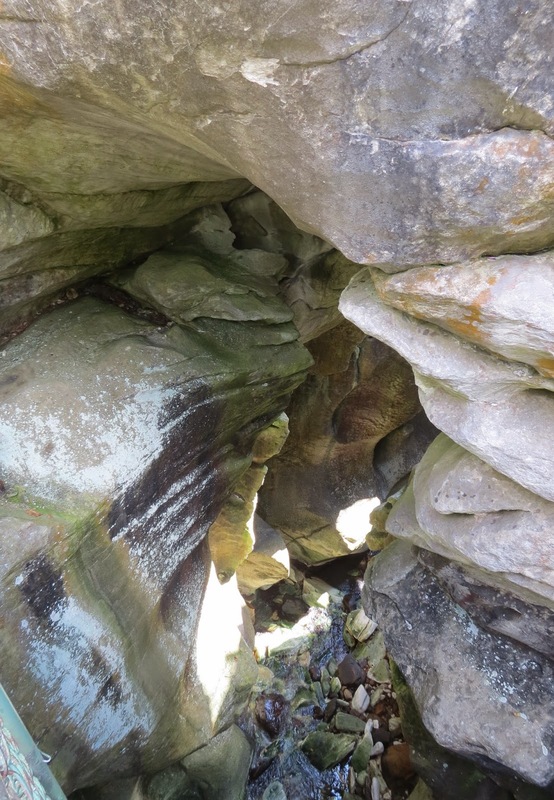 But this was a day trip to Natural Bridge State park. 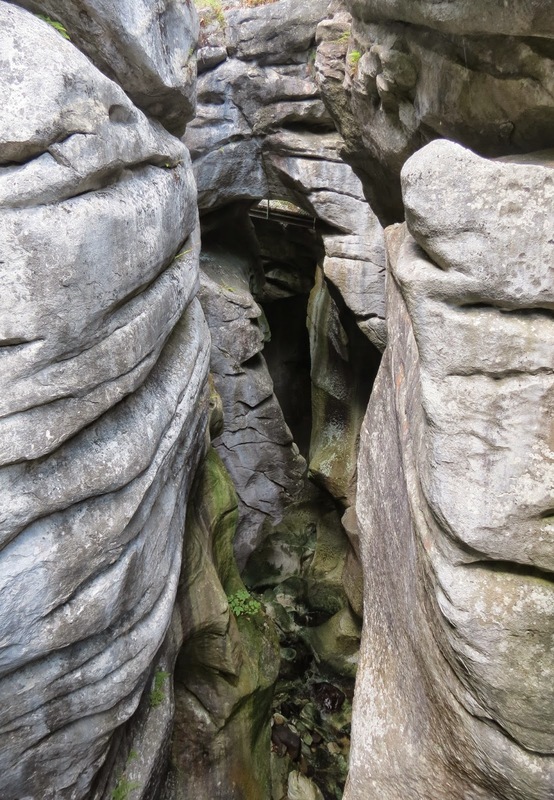 The trail to the Natural Bridge. 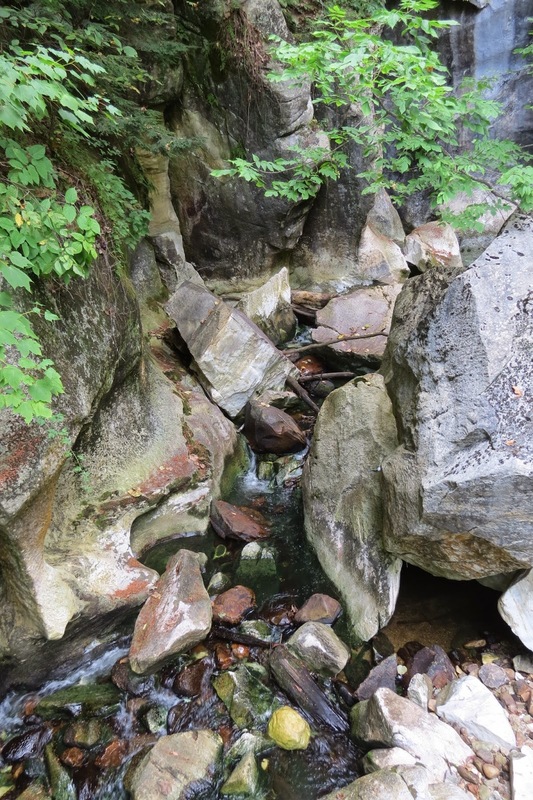 It is located at the site of an old marble quarry. The only dam constructed of white marble in North america. Potholes formed below the dam. Looking down through the gorge carved by the water flowing below the dam. 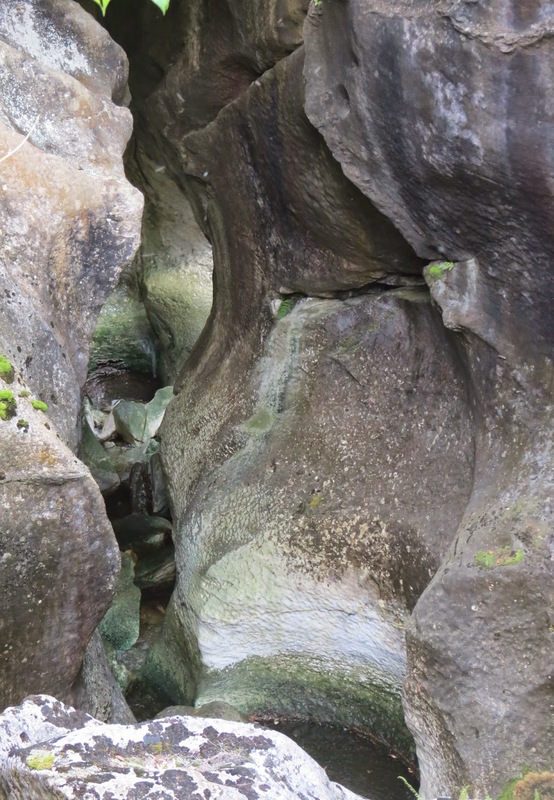 This is the natural bridge…of marble. 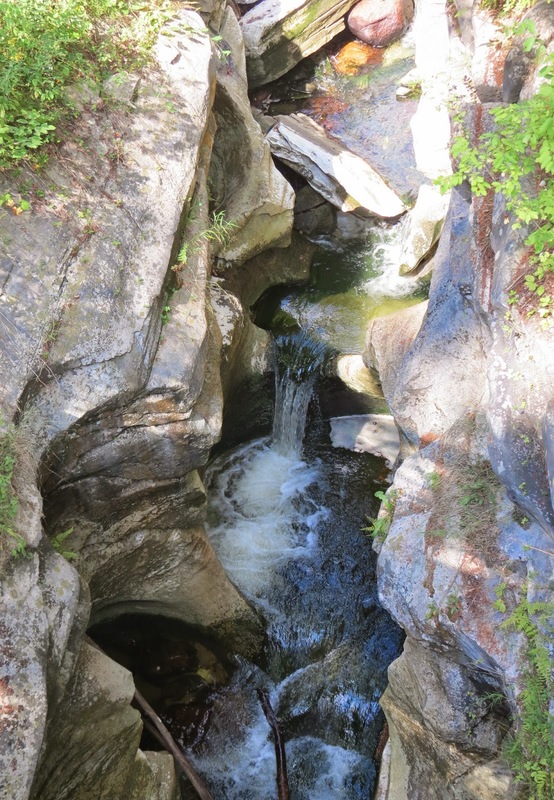 The natural bridge over the gorge. The large granite boulder across the way is a glacial erratic carried here and then left behind as the glacier retreated. 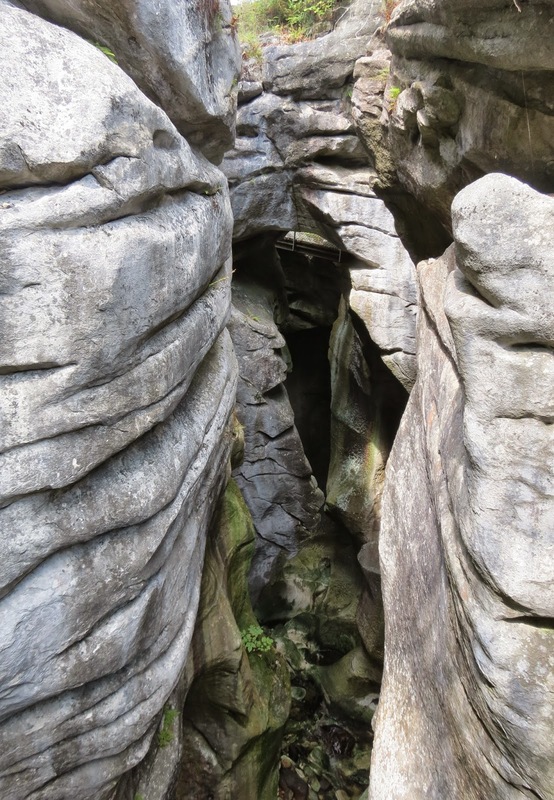 There are many stairs into and around the gorge and old quarry. 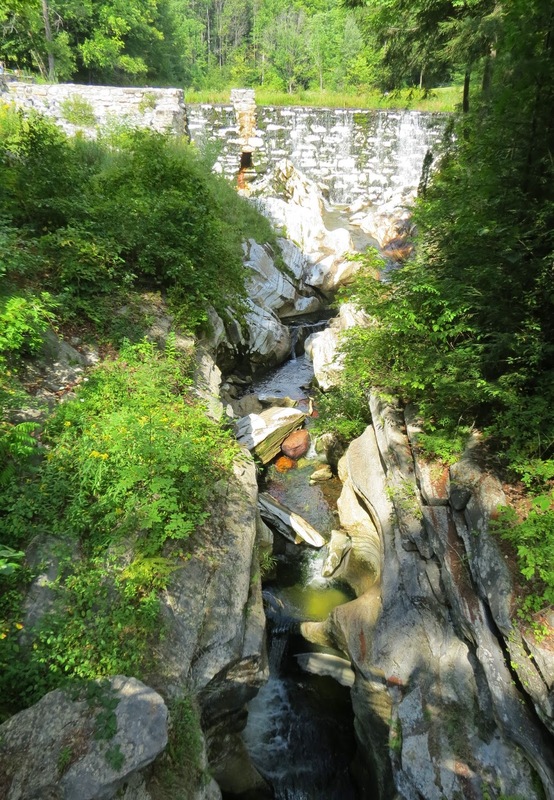 The top of the natural bridge. People carved their names in the marble in the 1800s. Another view of the quarry. Stairs lead down inside. A view from the other side of the marble bridge. And the water continues its flow below the bridge and out of sight. Heading back to the parking lot, I noticed this sculpture garden. The sculptures were created by teenagers as part of a community project. The next day I decided to do the driving tour to the top of Mt. 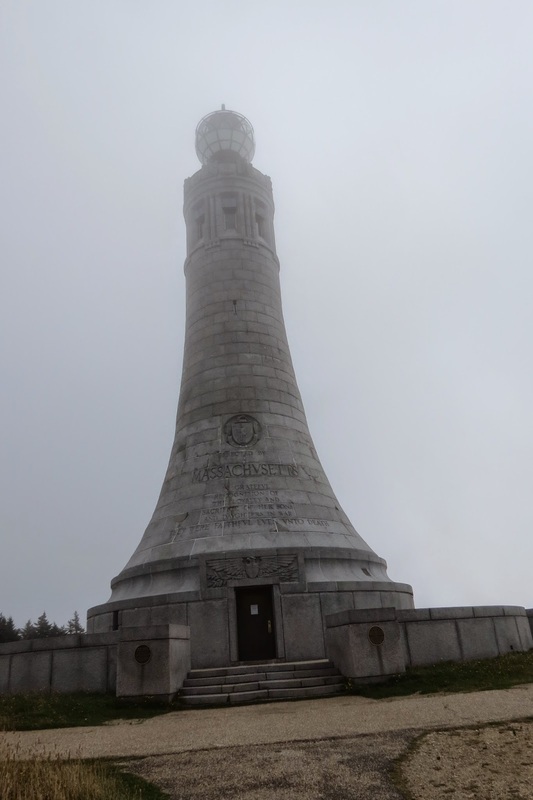 Greylock, the highest point in Massachusetts. Unfortunately, a front was heading our way, and the views were not to be as nice. The tower in the clouds. On a clear day it can be seen from miles around. The reason for the tower, I knew you'd ask. People trying to enjoy the view, haha. There are nice accessible trails for you to enjoy that view. And as I walked around the sky did begin to clear a little at the top..
Close up of the beacon. The view you could have enjoyed yesterday. This was the first state park in Massachusetts. Bascom Lodge, built in 1938. Aerial view of the summit. The Appalachian Trail crosses here. As I descended the mountain, the views got a little better. Looking back at Mt. 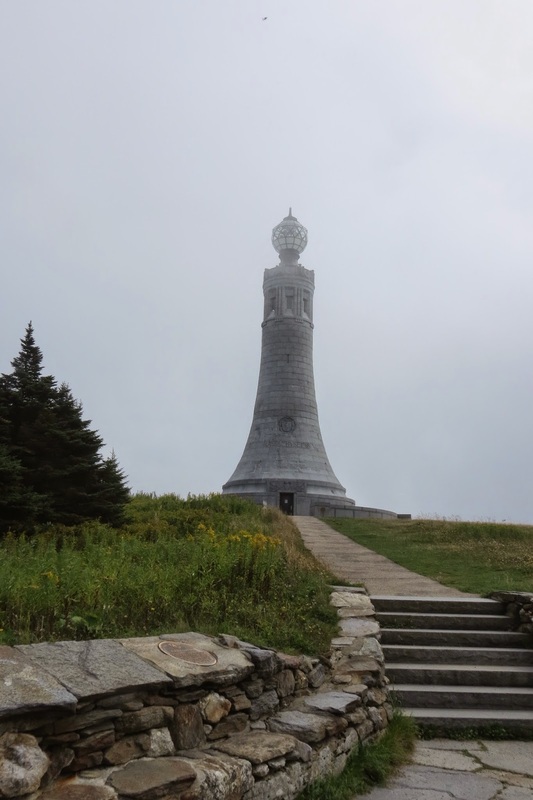 Greylock and the tower. I took a short cut here (in the car)…17% grade down into North Adams. I made it back to the campground just as the rains began. It rained almost all night, but today the sun is shining. I have moved to a campground 70 miles away, just inside NY. More hiking and exploring to do here, and I have a friend coming to join me! Also I have internet and cell service here, so all is good.